Wood duck babies are so cute. 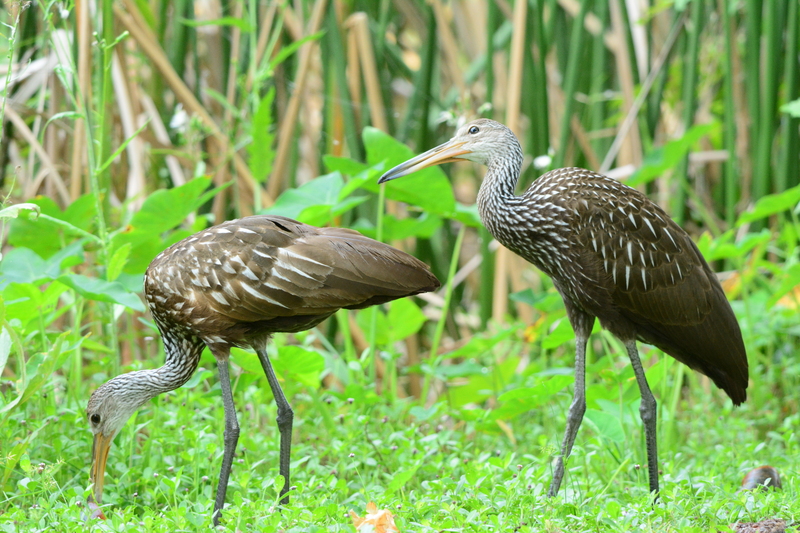 I found this little family at a hidden pond at the Largo Botanical Gardens in May. 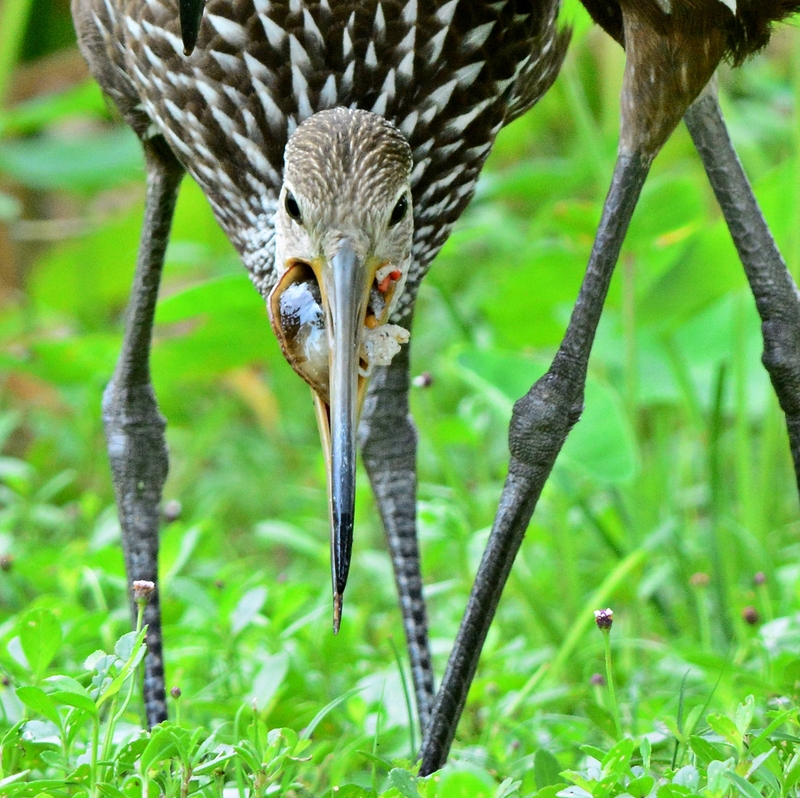 After walking around the gardens, I headed over to Largo Nature Preserve and found this baby limpkin following Mom under the boardwalk. I was staring at this turtle that was sitting just underneath the below. A bald eagle was sitting on a utility tower in the park. I don’t think anyone else walking by noticed the eagle just sitting up there. All taken back in late April. 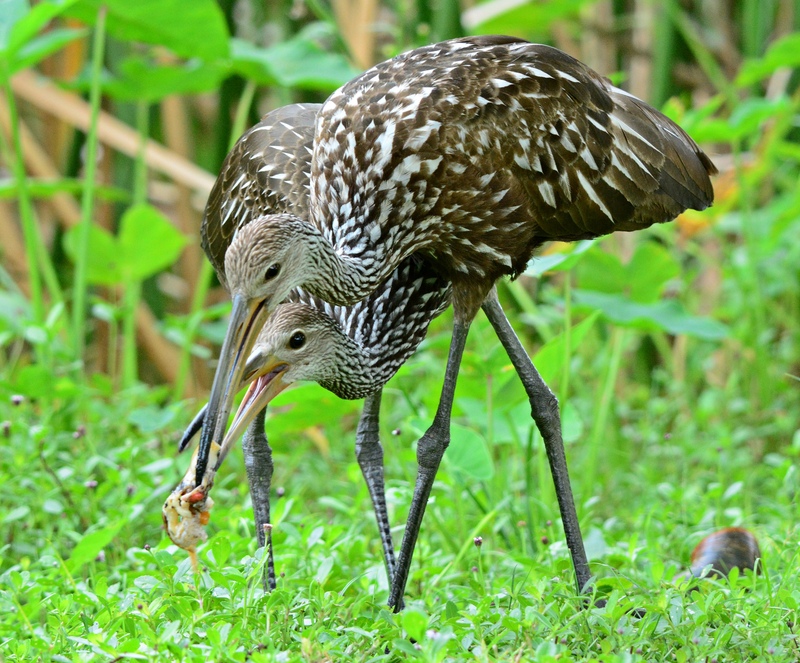 I was walking along the boardwalk at Lettuce Lake Park and look down and saw this limpkin family. 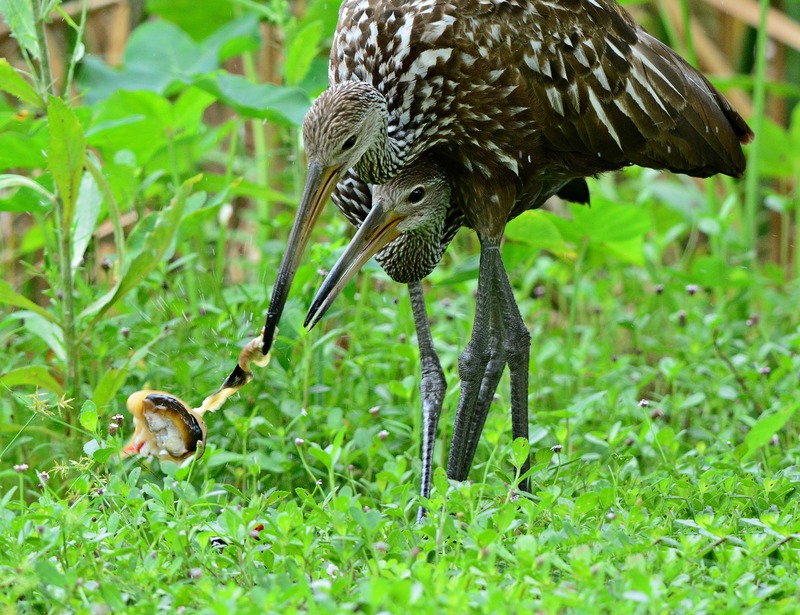 The Mom was teaching the littlest one how to find the snails and get the food out. 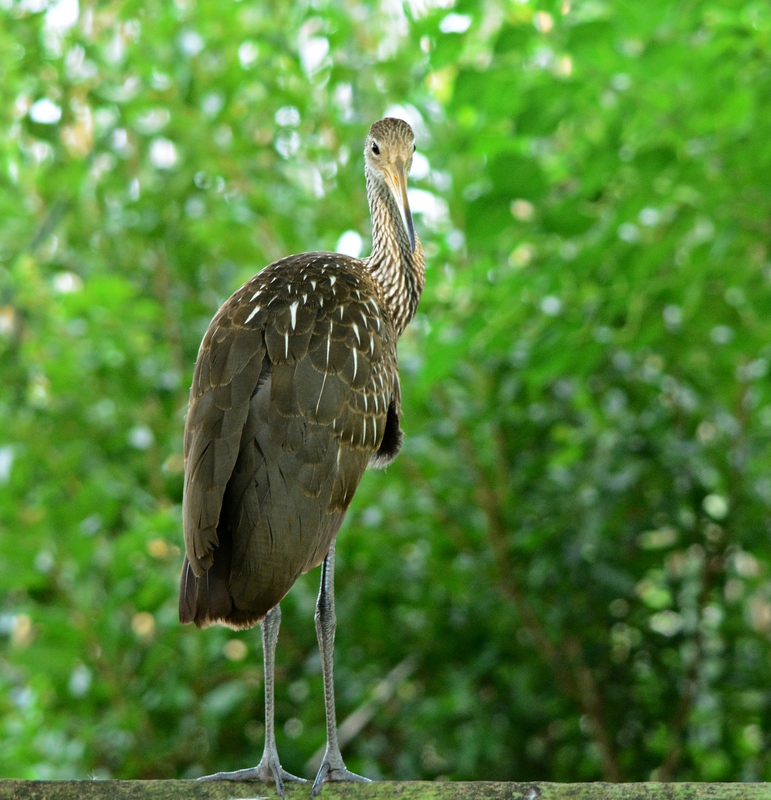 After feeding the last one, Mom needed a break and she flew up to the boardwalk and stood next to me and stretched. 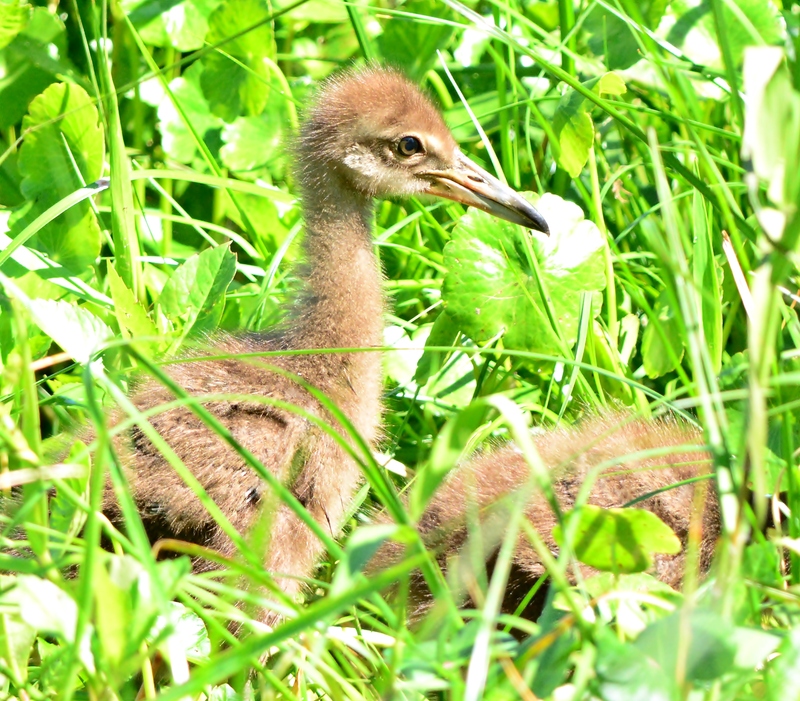 The 3 little babies kept busy by themselves while Mom rested on the boardwalk rail. 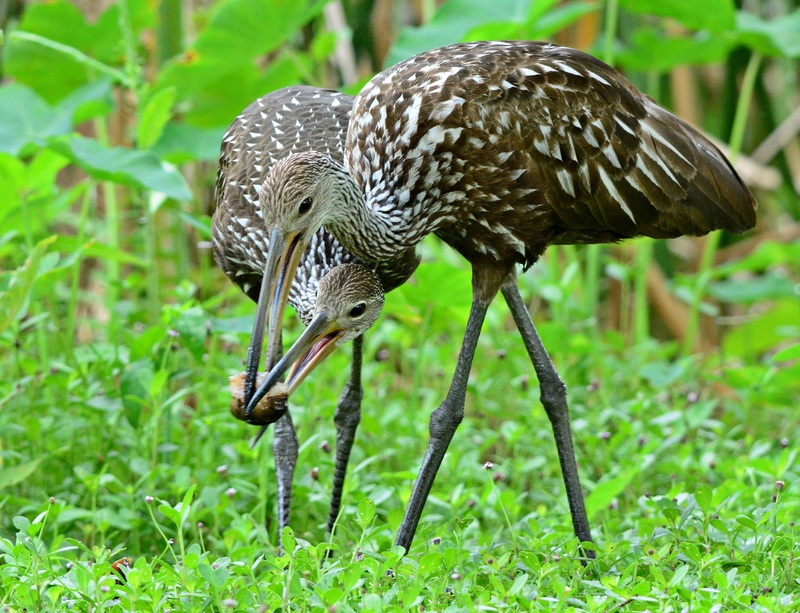 They were busy preening and trying to find their own snails. Every once in a while they would look up to make sure Mom was still there. Eventually, someone came walking down the boardwalk so the Mom flew back down into the swamp and started to walk off with the 3 little ones behind her. An early June walk at Lettuce Lake Park. I think this is a very young red-eyed vireo. A prothonotary warbler. They nest here in the summer. I heard whistling and saw the black bellied whistling ducks on the top of the observation tower, only because there weren’t any people on the tower yet. I snuck up the first flight of stairs and saw them looking down at me. I didn’t want to scare them off so I went back down and headed away from the tower. After a few minutes someone came down the boardwalk and headed up the tower so they flew off. Some of the little critters at the lake. 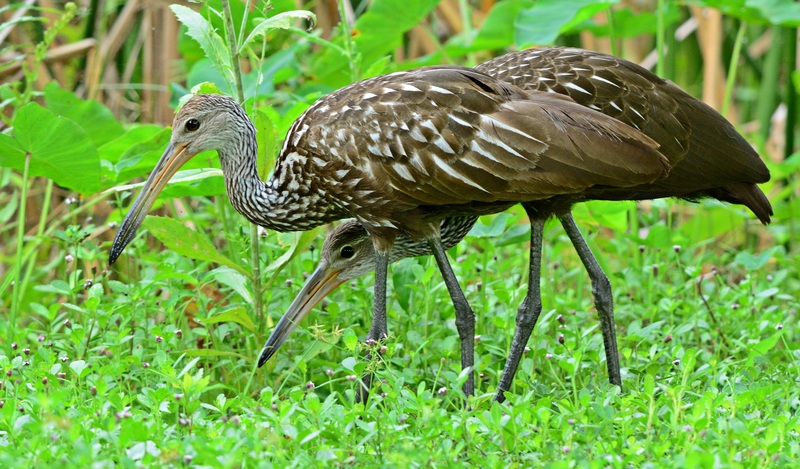 Some young limpkins hiding under a tree near the boardwalk. I stumbled on this muscovy duck family at Lake Morton back in late May. They were so cute. They stayed close together and close to Mom. I rarely see all yellow babies so this was a treat. 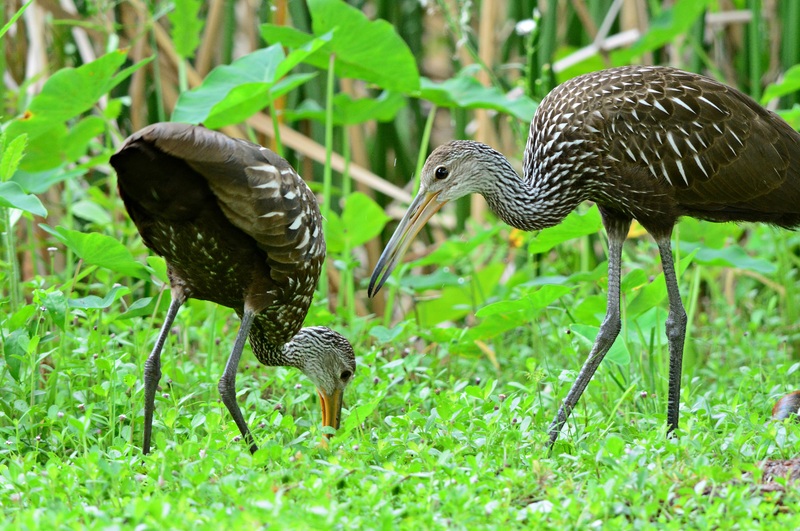 Near the duck family, hidden in the reeds along the lake, was a family of limpkins. There were 3 babies that were very shy. I couldn’t get them all together. They did not want to stay in one place very long. Mom wanted to take a nap and the babies kept moving around. A little dose of cuteness for the morning. 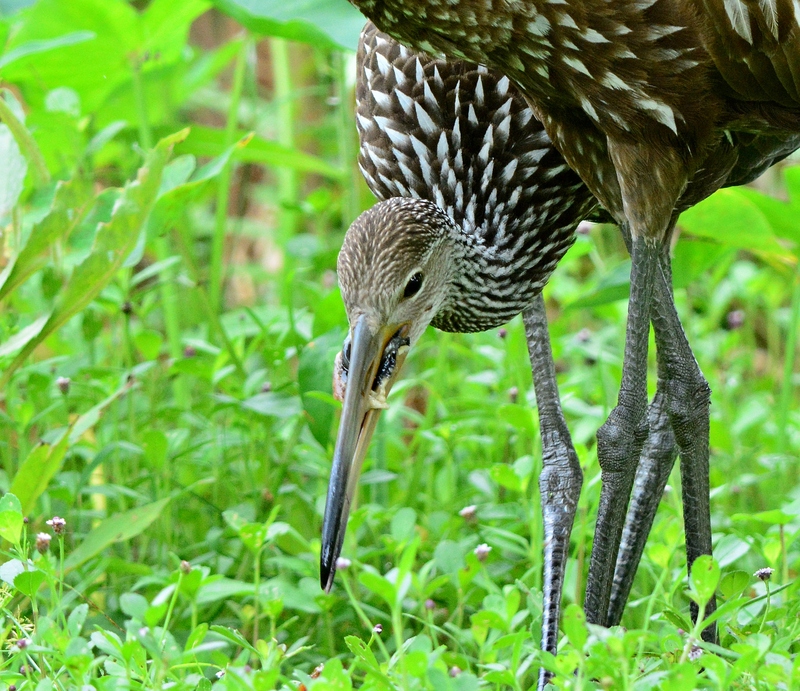 I heard there were limpkin babies at Circle B Bar Reserve but wasn’t counting on seeing them. They could have been anywhere in that huge place. For once, I got lucky. They were just off one of the main trails. I probably wouldn’t have seen them but I was watching a hawk sitting in tree nearby and he was looking down on the ground. 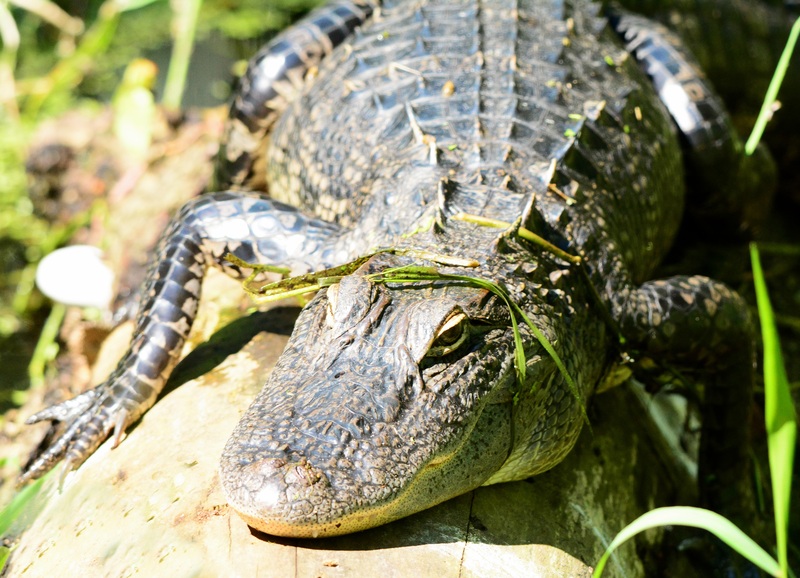 I’m thinking “What is he staring at?” when I noticed a pile of fuzzballs sleeping in the reeds. At first I didn’t see any parents and thought “Oh no, breakfast for a hawk.” but a few minutes later both parents showed up with food and stayed with the 5 babies after that. 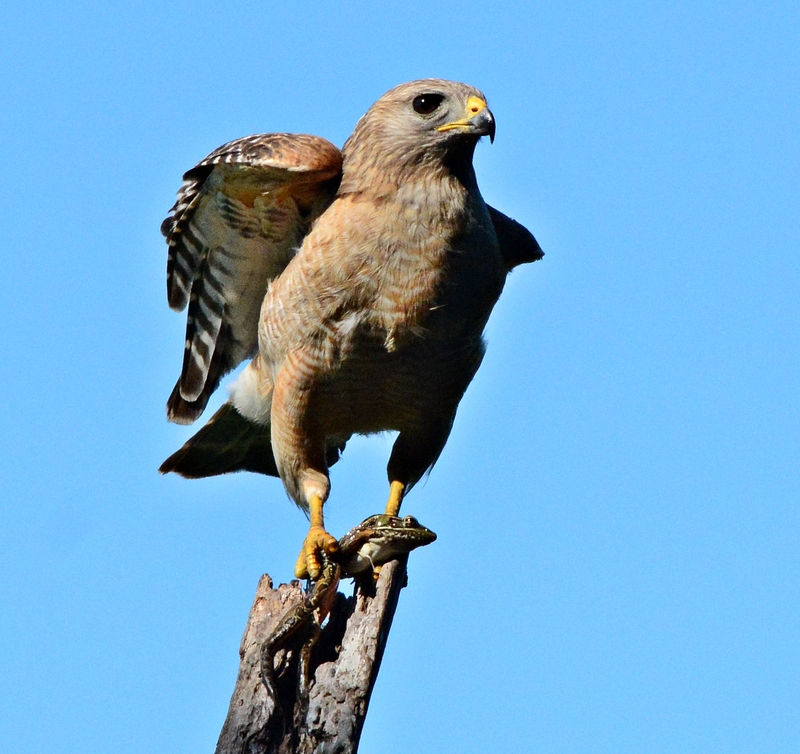 The hawk eventually flew away. 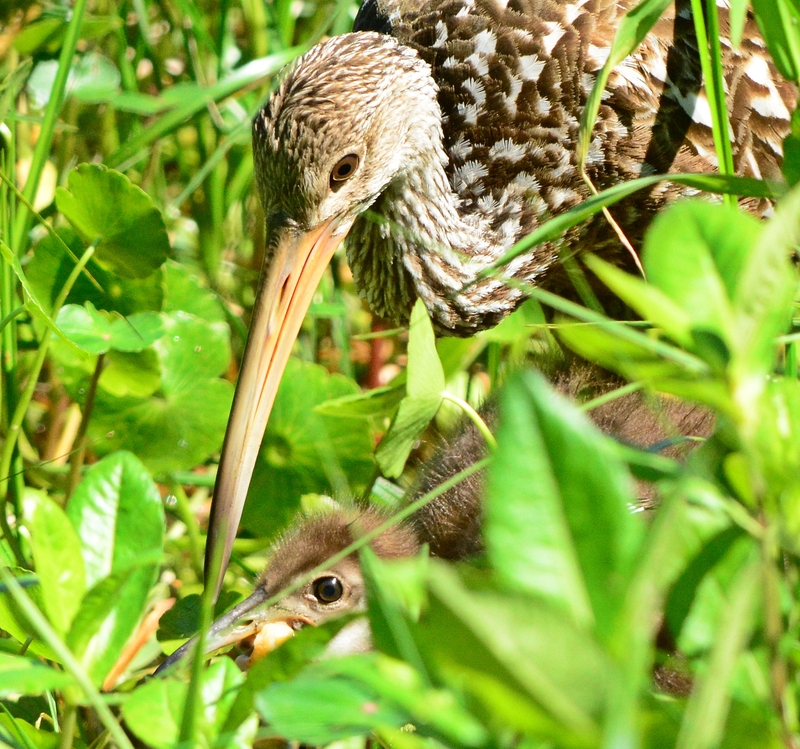 If he has swooped down toward the babies, I would have had to make a decision whether to jump into the swamp (knee-deep with alligators and snakes around) to save them or watch sadly from the safety of the raised trail. Luckily I didn’t have to decide, this time anyway. 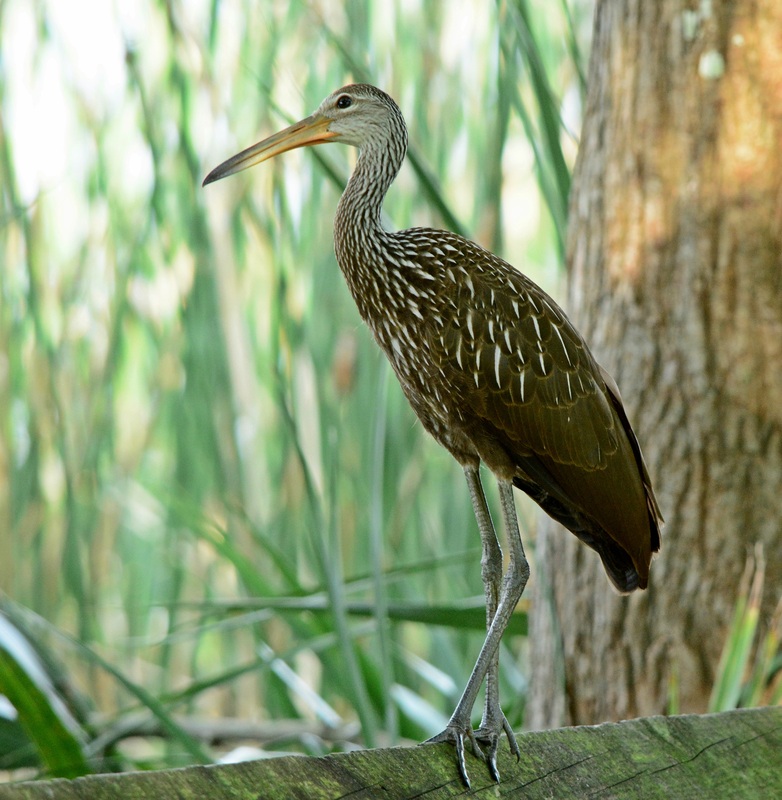 I don’t see limpkins often at Chesnut Park. 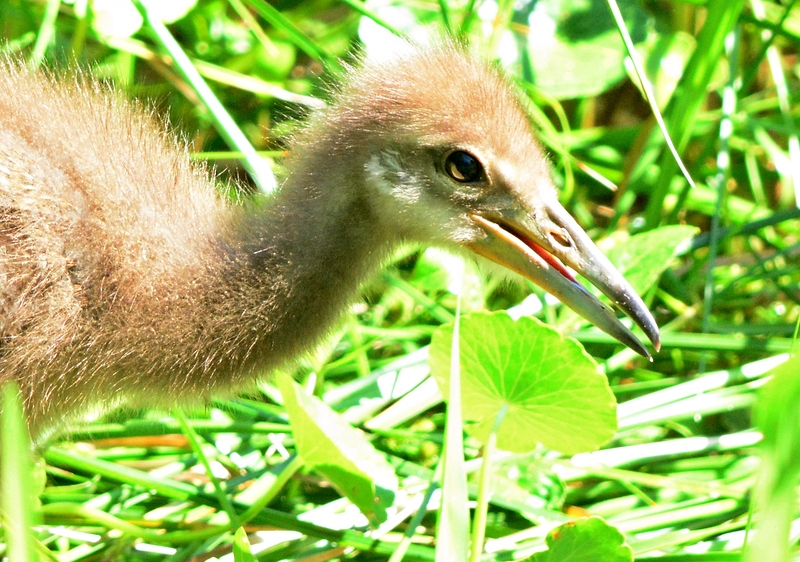 This morning in mid-June, I heard what sounded like baby bird crying. The sound was coming from far in the corner near the lake. 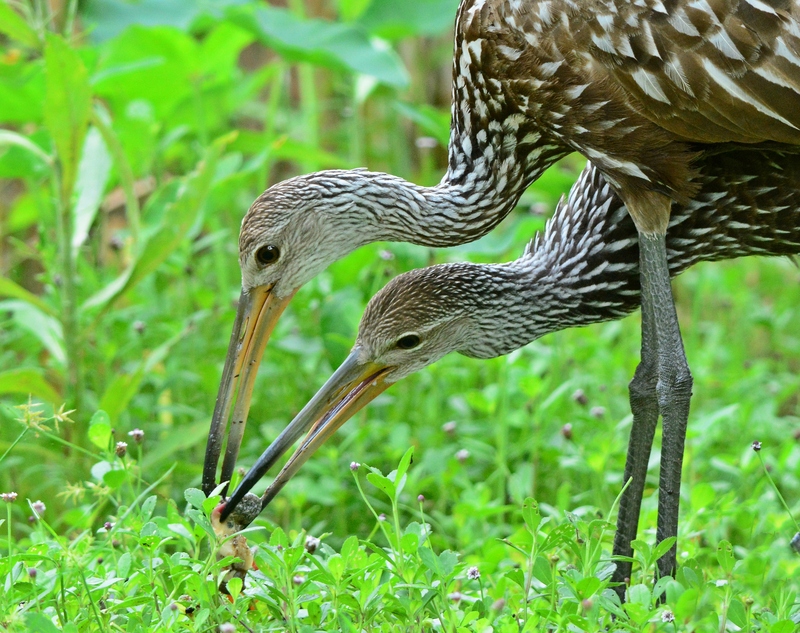 Three almost grown baby limpkins were still being feed by mom. 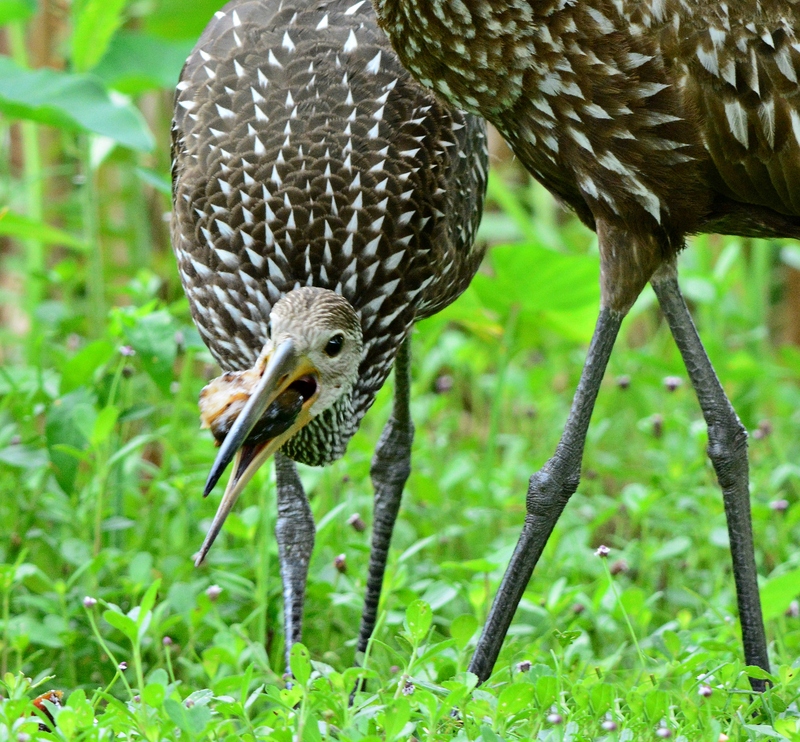 They were the size of the parent but were still making that hungry baby bird wheezing noise. 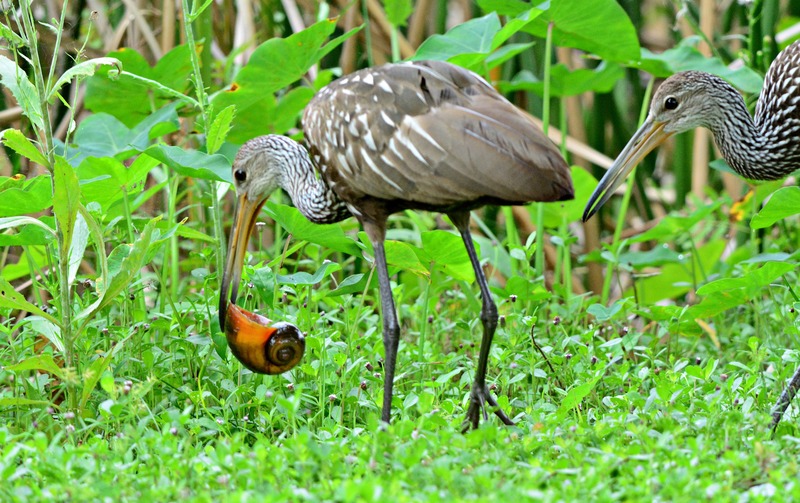 Mom was busy pulling up one snail after another and feeding each of the babies. I sat down on a bench under a picnic shelter and watched them for a while before heading home to eat lunch as well. 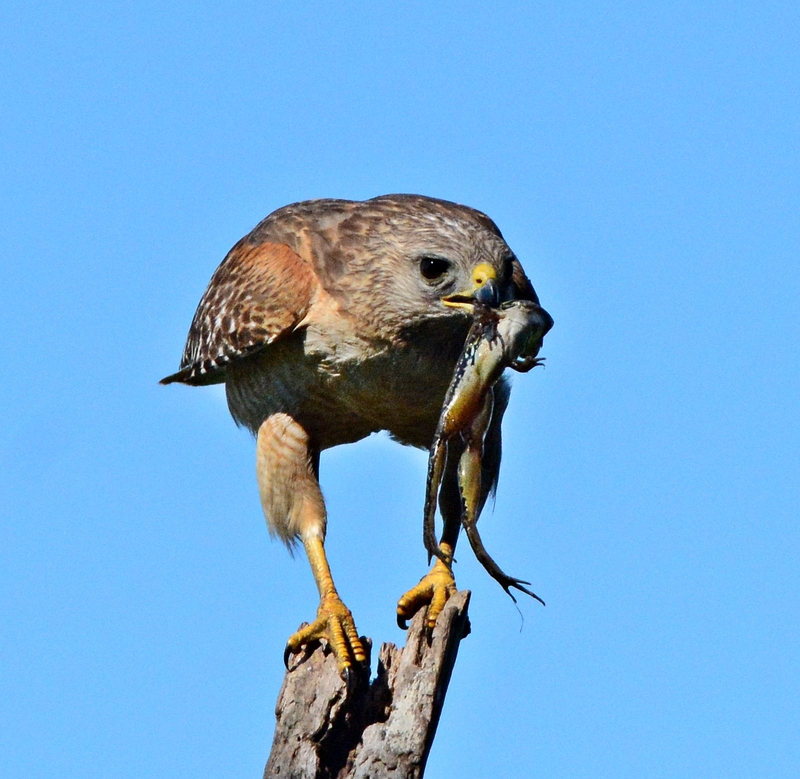 A hawk with breakfast for his babies. He landed on the stick and I could hear babies screaming from high up in a tree close by. After a few seconds he headed over and I could hear those babies excited that frog was for breakfast. I couldn’t see them but they were loud. 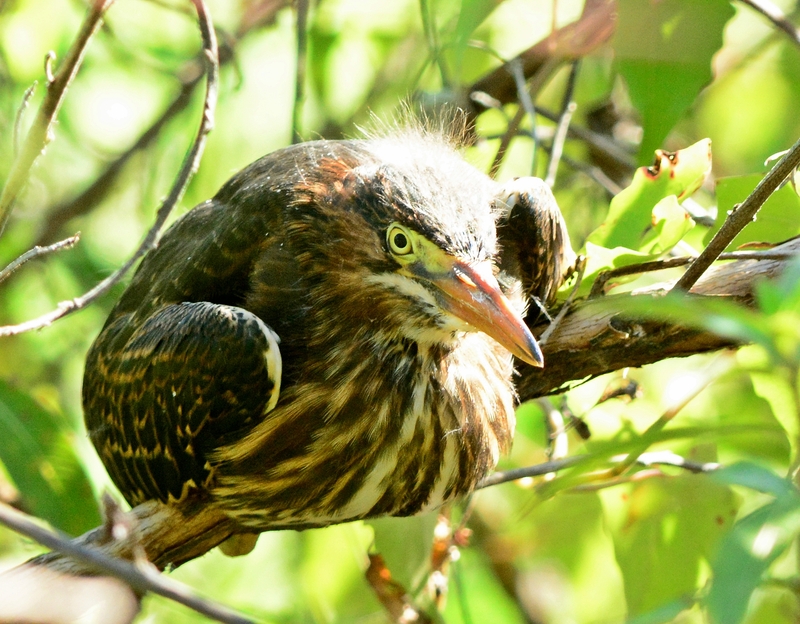 A juvenile green heron hanging out close to the nest. He’s still got that baby fuzz on the top of his head. 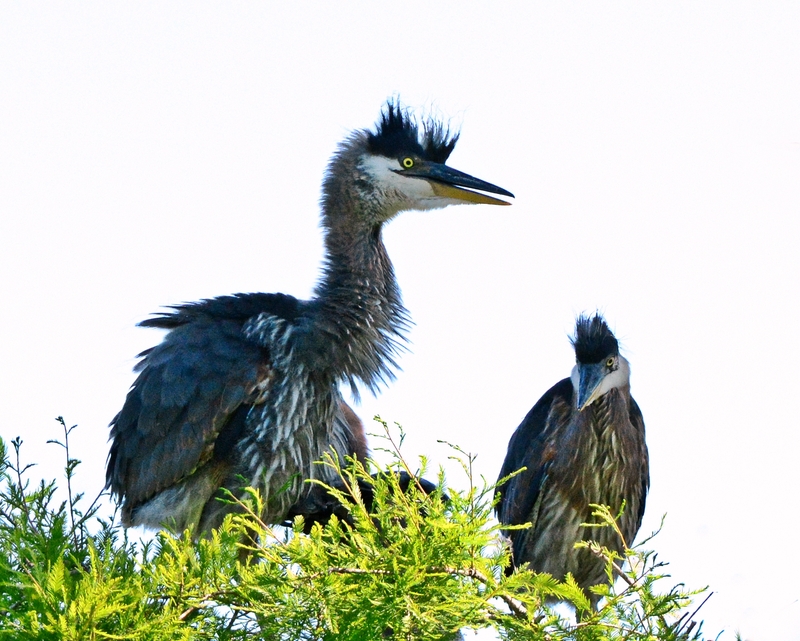 Two almost grown great blue heron babies waiting for Mom to bring home lunch. 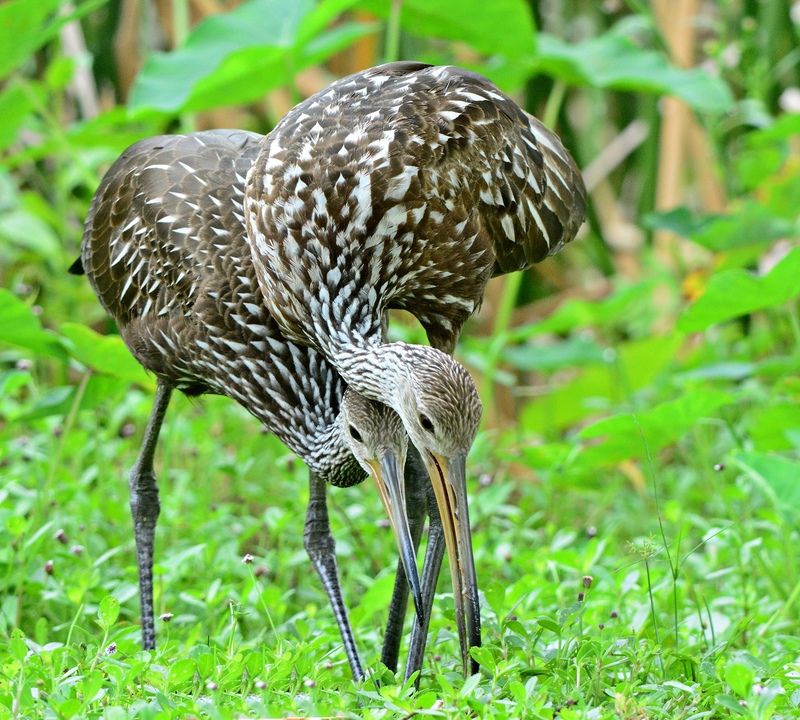 There were three of them but the third one stayed low in the nest. These guys were pretty far off the trail so this is extremely cropped up. 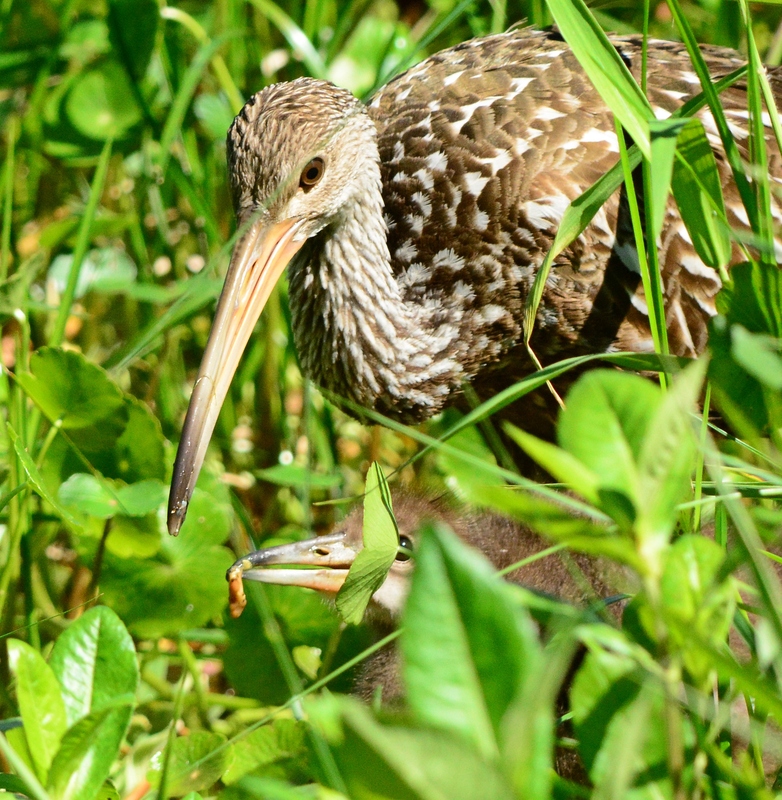 Baby limpkins were getting snacks from their parents. You could barely see them over the tall grass. Summer is here. Lazy days are ahead. 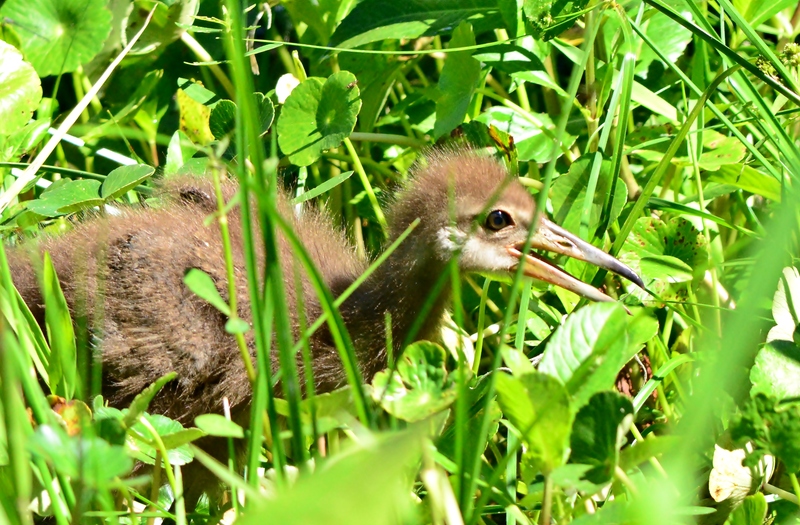 All of the winter birds and ducks have left for the summer but Circle B Bar Reserve was full of babies. 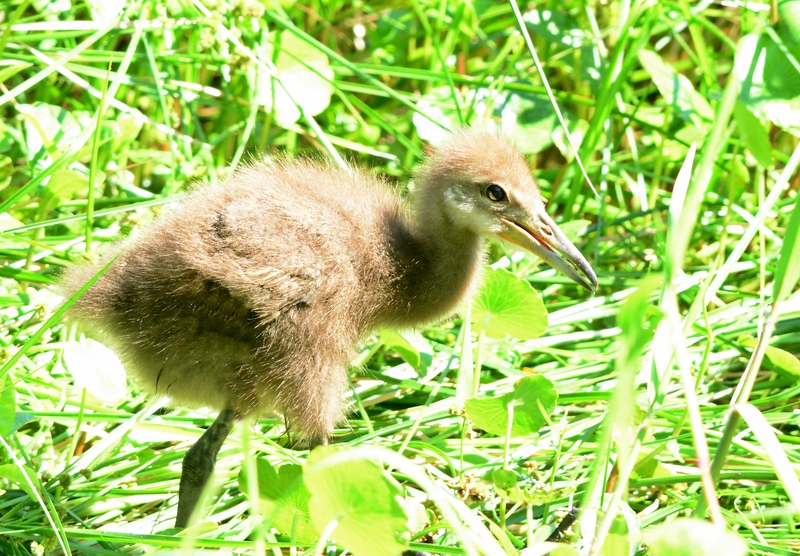 Baby hawks, baby limpkins, baby great blue herons, baby sandhill cranes and baby moorhens were everywhere. By now all of these guys are grown up. Except for the moorhens. They’ll have babies all summer long.